Another buy miles offer to let you know about today. United MileagePlus is offering up to a 100% bonus on buying miles but only if you buy 20,000 miles. The first 1,000 people to do so will get 40,000 miles in total for US$752.50 or about 1.88 cents per mile. 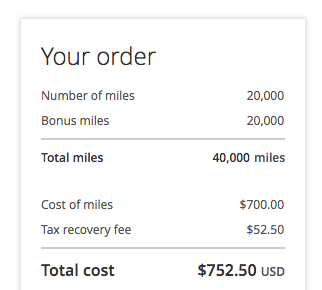 The next 2,500 people after that will get a 70% bonus or 34,000 miles in total when buying 20,000 miles. This offer expires on June 19.